We will eventually be transcribing all of Lavater’s text (or all pages of it that have Blake’s writing on them, which constitutes the vast majority of them) and using <annotation></annotation> to describe any writing or markings not by Lavater. All such markings happen to be by Blake with the exception of a very small number of pencil markings that may or may not have been by Blake as far as anyone knows. 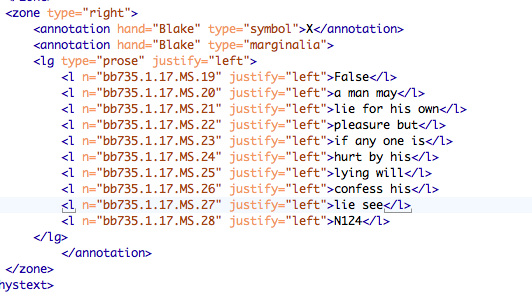 So within each <annotation> element we will be using the attributes ‘hand’ and ‘type.’ The hand is virtually always Blake with the exception of those few uncertain marks, for which we will simply use hand=”anon.” In most cases, the ‘type’ will be either type=”underline” or type=”marginalia,” but we are also using “symbol” to describe situations where Blake puts a big “X” or something next to a line or paragraph. The other types we have, like ‘deletion,’ ‘addition’ and ‘substitution,’ are mostly for helping us deal with situations where Blake crosses out parts of Lavater’s original text and in some cases replaces it with his own. We are finding that in the majority of situations it makes the most sense to partition off Blake’s marginal annotations from Lavater’s text by using <zone></zone>. 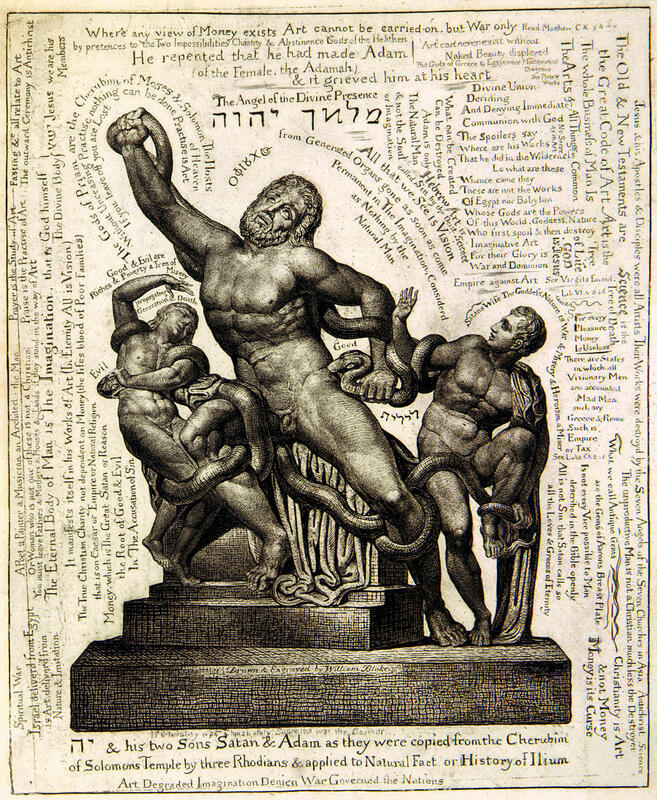 So Lavater’s text would be inside of <zone type=”body”></zone> and then if Blake wrote a lot of comments in the left hand margin, they would all be enclosed in <zone type=”left”>. The zone system threatens to become very complicated in situations where Blake has writing all over the page, but since a lot of Blake’s marginal comments do not line up geometrically with lines of Lavater, it is not expedient or accurate to try to locate them within <annotation> tags within the lines of Lavater’s text. From the several pairs of pages I have tried transcribing so far, I have found that this relatively simple tagset works remarkably well. So far I have not encountered anything that looks like a serious and insurmountable problem. In fact, one of the only real drawbacks I have found in transcribing some of these pages is that in some situations the <annotation> tags can be a bit bulky and awkward. This is the case when many lines of Lavater’s text are underlined by Blake. Despite the bulkiness, this is the way we will continue to transcribe lines of Lavater that are underlined by Blake. 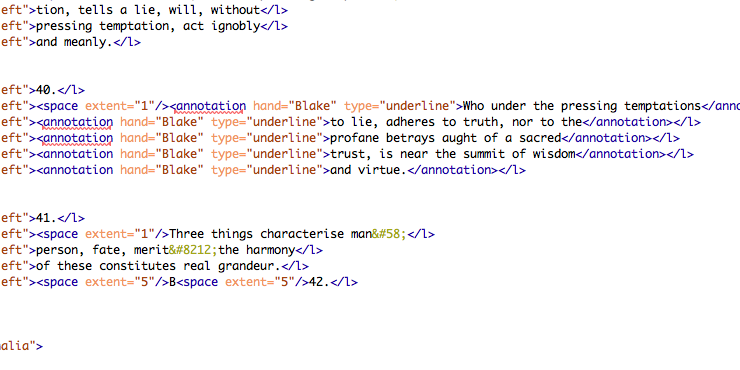 Since the Blake Archive always transcribes objects line by line, using the <annotation> tag for each line in succession accords with our editorial principles. The good news is that when it comes to transcribing large chunks of text written by Blake in the margins it actually looks very crisp. This is because we can put all the text inside of one <annotation> tag, so within that tag we can transcribe all the lines the way we would transcribe lines of anything else. We have not currently decided what would make the most sense for the line numbers. If the last line of Lavater’s text is ‘16’ should the first line of marginalia transcribed be ‘17?’ The more I think about it, the more I think it would be preferable to have some means of establishing an alternative numbering system for lines of Blake’s marginal annotations to indicate that this is a different series of lines. After all, numbers suggest sequence and continuing to count after the final line of Lavater would seem to suggest that the marginalia comes after the Lavater text in sequence. Doing something to the effect of a 01a, 02a, 03a, would actually come closer to making the marginal comments parallel with the corresponding Lavater text. Obviously the numbers still would not match up the the Lavater lines to which they are adjacent, but at least the two sets of numbers would be oriented in the same direction (i.e. if there are several comments by Blake in the left margin, the order in which they are transcribed will correspond to that of the Lavater passages to which they are adjacent). 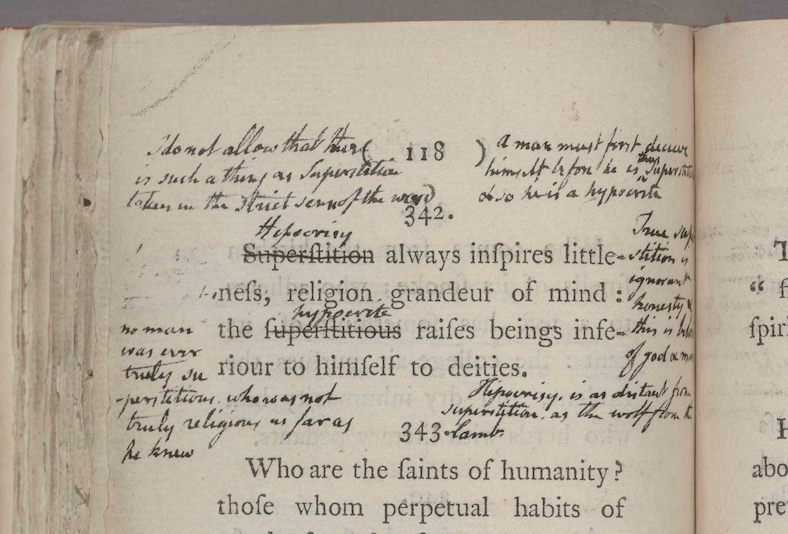 One other question is how literally do we interpret the term “marginalia?” Is basically all of Blake’s writing on Lavater’s book marginalia, or does marginalia just refer to the text in the margins? 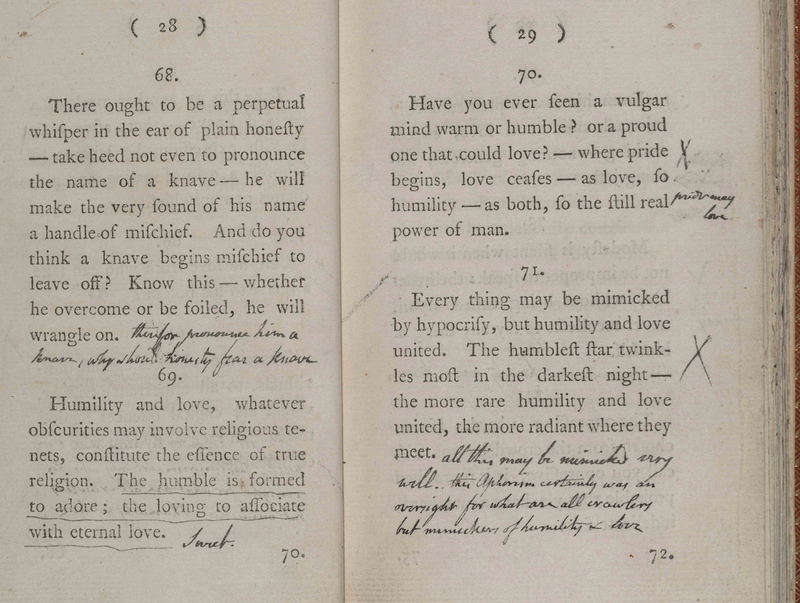 For example, in some books owned by Blake, he fills otherwise blank pages with his own writing. 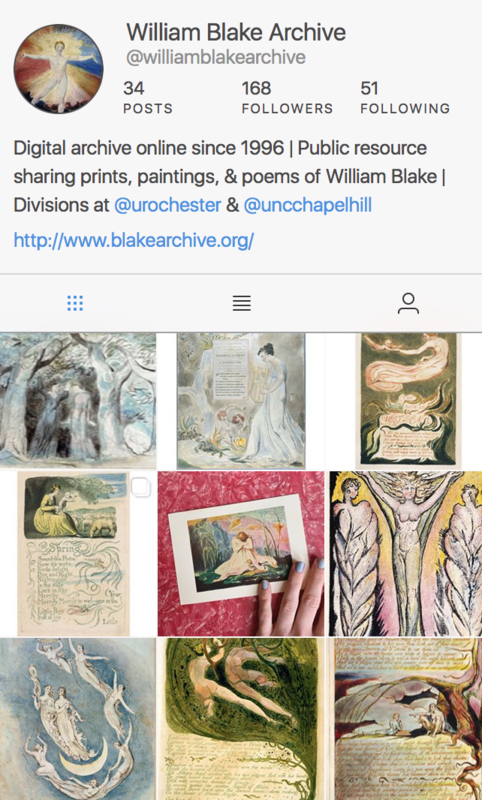 It seems that at the moment we are calling a situation like the one in the above image an “addition.” Things that fall under additions, deletions, and substitutions are not marginalia, but what about things that Blake writes between aphorisms, but not attached to either the aphorism above or below? 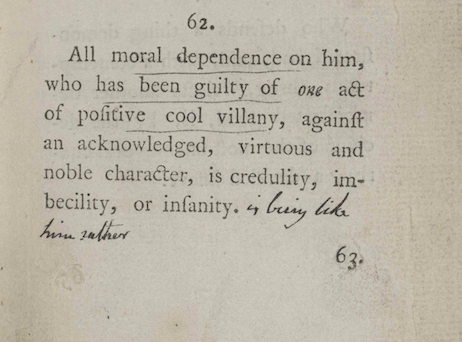 I’m thinking these annotations would be considered marginalia even though they are not technically in the margins. The tag set that we have begun to use makes sense, and it seems user-friendly enough for the pages of Lavater that I tried transcribing, but I have not been quite bold enough to venture into some of the craziest pages yet. That can be the project for this week and is sure to bring new questions and challenges. We will think about what worked and did not work with this test tagset when we sit down to decide what the real tagset for encoding Blake’s marginalia will look like.